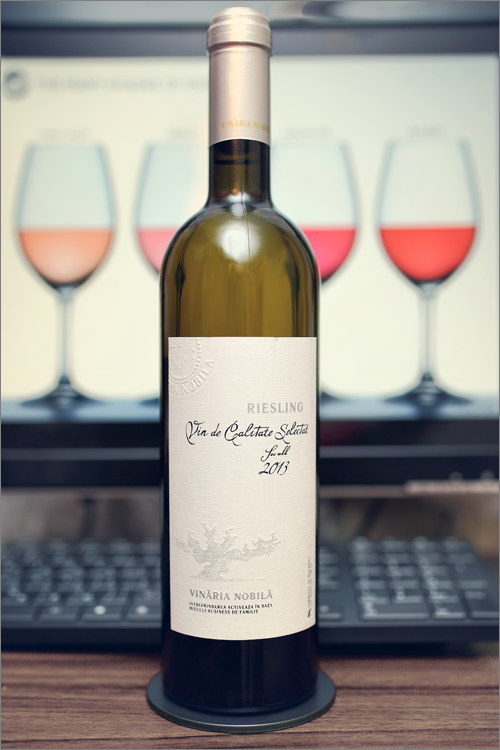 We will continue to review Wine of Moldova and we’ve decided to change the style – we’re diving onto the white wine theme for a while, and why not start with a bang – it is time for some riesling wine. It was not too hard a choice this one, as there are not so many riesling wines available on the market these days, but as the saying goes, all good things start with a try, and here’s ours – Riesling 2013 from Vinaria Nobila. The wine has a bright, very transparent and pure green color, with the rim-color of a clear yellow shade. The nose is rich, with some hints of cork taint, which disappears after just several minutes of aeration. The first nose is sharp and insistent, and it brings savory notes of green bell pepper, straw grass, gooseberry, green olive, nettle, green bean and green tea, all of this mixed with notes of lemon, green apple and quince, form a very explosive summer mix. The wine is dry, with no hints of residual sugar, moderate alcohol and high to strong acidity. Medium tannin level makes it taste a little bitter but fresh. The dominant feeling is smoothness – the wine feels silky in the mouth, but crisp and sharp. The overall balance is good – the wine is really refreshing with an insistent, a bit green but savory, old-world body. The wine has a long finish and a velvety-tight aftertaste, it feels a bit reductive, a little too much into the savory for a riesling wine. Last but not least, it is to be mentioned that we’ve been quite impressed by this one – a very refreshing summer wine, that will appease one’s thirst almost in an instant, but, on the other side, it is a riesling wine with quite nuanced savory notes – a quality that is not common for this grape variety. All in all, we cannot say that we don’t approve it, because there are times when thinking outside the box may bring up some very surprising final results – as this wine for example.